Or to put it more bluntly – no acoustic instrument requires you to check your operating system version and install software and configure audio drivers. (Cough.) You get my drift. Your serious desktop software isn’t going anywhere, but there’s clearly a need for a starting point. Novation have already embraced Web technology as a way of configuring hardware and adding sounds, as with Circuit Components. Now, that Web tab can turn into a toy for making music. Don’t have a Launchpad? 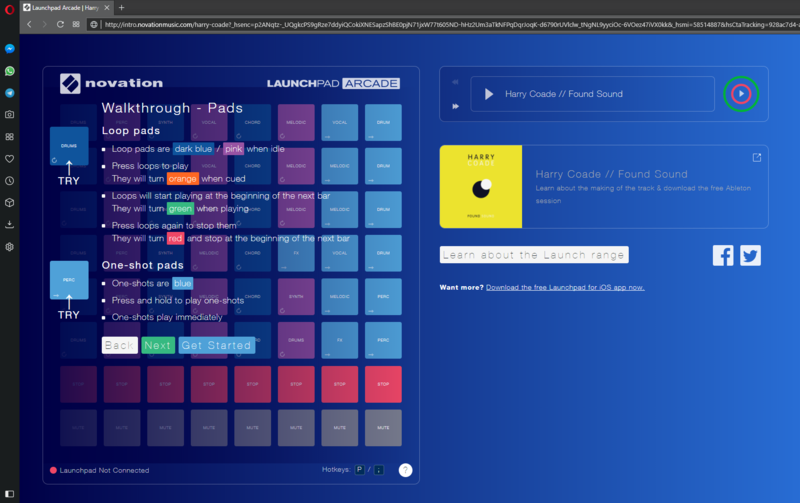 Now anyone can try the grid in the browser, to see what a grid interface feels like. Just brought home a Launchpad from the shop? Plug it in, fire up a browser, and start playing. Once that’s working, you can always tackle installing and using Ableton Live Lite (or another tool) later. Have at it! You get some fun features – loops, one-shots (sounds you trigger directly that play just once), and channels for different parts. The Launchpad isn’t the fanciest grid out there these days, by far – but maybe its simplicity is itself an advantage. You really just focus on the grid and sample functionality, and the Launchpad range are lightweight enough to move informally around the studio. They’re also streamlined enough that they’re dead-simple to program as MIDI controllers. It’s a shame that audio and MIDI aren’t more widely standardized in the industry. Google are leading in browsers as some other browser developers drag their feet. (Apple and Microsoft are especially guilty there; Mozilla actually led the way but now is playing catchup – their new browser is great, so I’m hopeful they revisit this on that platform.) And then Google are lagging when it comes to support in their own Chromebook line – which defies any logic, since this sort of tech would make even more sense in Chrome OS. That’s especially disappointing as educational buyers increasingly embrace Chromebooks in schools. Then again, that’s why even simple proof-of-concept stuff is so important. You can play with this. And hopefully one of us can shove it in the face of some developers to get better support for this tech.